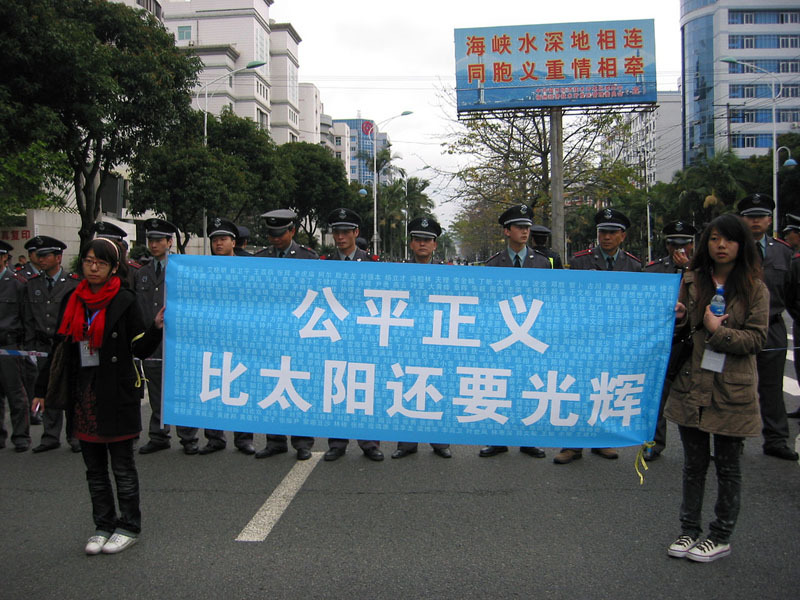 It has been more than 100 days since Wang Lihong lost her freedom. It’s really an unimaginable thing. She and I live in the same world, but Lihong not only is being held in a detention center, but has also been formally arrested. She was originally charged with “picking quarrels and provoking troubles” (寻衅滋事). The charge was later changed to “gathering a crowd to disturb social order” (聚众扰乱社会秩序) [sic]. In the middle of the night, I often think about friends who have lost their freedom. Among these, for me, Lihong has been my closest sister. She is two years younger than I am, about 56. She has a serious herniated disc and needs a metal brace for support; she is also very nearsighted. In her own words: “When I take off my glasses, I’m just like a blind person.” But at the detention center, you weren’t allowed to bring in a back brace and you had to take off your eye glasses. Dear Lihong, how are you able to cope with the hazy world around you? Lihong, who once suffered from depression and insomnia, how many sleepless nights must she now endure? Was she prepared for this long detention and even arrest? Will she be filled with trust when she thinks of us, her friends, confident that we would run to help her as she would for those who were suffering? And how disappointed will she be in our inability to help her! Lihong did not pursue arts. After spending three years in a production brigade in Yan’an, she passed the entrance exam for admission to the Chinese literature department of Yan’an University, and returned to Beijing after graduation. In the 1980s, Lihong worked in a government office in Beijing. In the spring of 1989, like cadres in many other government units, she marched with the protesters. She has kept, to this day, the clothes she wore during those demonstrations, which are emblazoned with the words: “Long Live Freedom.” One can well imagine why Lihong left her job at the beginning of 1991. The world of mortals surges on, and our destiny rises and falls. Lihong was materially satisfied but not happy, until a few years ago, when she, Laohu Miao,2 and others got together and launched a volunteer effort to help petitioners who came to Beijing but had no place to stay. Lihong reawakened that soul that had longed to be “so free, so rich, and so beautiful,” and recovered the ideals, friendships, and intrinsic richness of her youth. Lihong drove me to visit the painter Yan Zhengxue. We chatted in the car about our experiences during our lives. I got to know her on the Internet because she and my friend, Wang Keqin, had been following the death of Li Shulian, a female petitioner from Shandong.3 Lihong had posted exhaustive details about the case on the Internet, and she personally traveled to Shandong to gather information. 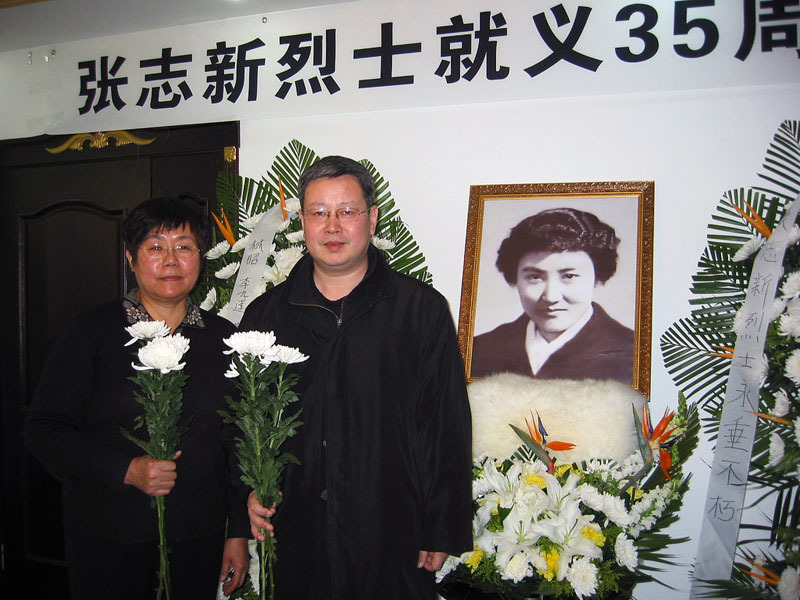 There was also the Deng Yujiao incident4—she and Tufu5 had gone to Badong County6 to get information. One could say that the path of Lihong’s life was changed because of the Internet. The Internet has coalesced people’s ideals, and enabled those who are concerned about the fate of the disadvantaged groups to go from online to offline, and to strive to change the actual destiny of people. In order to write Lihong’s story, I spent yesterday reading her blog. Many people witnessed her running around trying to raise concern about the Three Netizens of Fujian.7 But how did this all come about? I once heard Laohu Miao tell a story that sounded like a children’s fairytale. A person in Fujian set aside a portion of his small salary every month in case one day a person, facing a tragedy, came to him for help. I really couldn’t believe it. Could there still be such a pure person today? I really couldn’t believe this. Under our special national condition today—where filth is painted as something pure and holy, the corrupt are hyped as heroes, and morality has already reached a bottomless low—are there actually people who persist in doing good despite being called foolish! You Jingyou,9 I really wish you weren’t in there but here in Geneva. The air is clean here, and the tree-shaded roads fill people with dreams. You Jingyou, you’re just a high-level bridge engineer, you’re not God! Please don’t be so good; please don’t make us feel so ashamed! Frankly speaking, the first time I heard his story, I was a little skeptical. I’ve met too many swindlers in my life, and was tricked too many times. But then I saw and heard: You Jingyou was really someone who put into practice his belief that kindness can provide warmth to others, and that love can change society. I was very moved by him. In the masses, Lihong is an ordinary person, and the same is true for You Jingyou. These two are not famous scholars, artists, or distinguished people with high social status. Nor are they members of legal circles. But because they met on the Internet, they began to practice what they preached by taking up the responsibilities of a citizen. There are probably very few experts and scholars in China who dare speak out for the people from the lower rungs of society. But the participation of countless ordinary citizens as netizens has brought forth a new form of politics. This is the beautiful life that this country has never had before but that has begun, with citizens joining together through the Internet and playing a role in public affairs. Regardless of their social status, people are gathering under the name of “netizens.” There is no need for knowing each other or using their real names. They only need a shared interest. Lihong’s effort to promote this action to fight for freedom of expression on the Internet is the socalled crime of “gathering a crowd to disturb social order,” with which the procuratorate has charged her. . . .
Who says we’re trying to rescue you? We’re fighting for ourselves. You are our conscience, and we don’t want the last bit of conscience to be buried by cowardice. It’s you rescuing our conscience, our courage. It’s you who are rescuing the last remaining space for our speech. Why did Lihong become the initiator of the action to show concern for the case of the Three Netizens? In order to understand her motives and purpose, I sincerely request those who are concerned about Lihong, especially those who ordered her arrest, to read and re-read her letters. She began writing these letters on December 4, 2009, National Law Day. Five days before this, Sun Chunlan was transferred to Fujian to replace the previous Party secretary, Lu Zhangong. Lihong had some hope for this transfer. She believed that with this new beginning, there would be a change for the better for the Three Netizens. It’s said that there are 300 million netizens in China now, and so who can guarantee that every word written on the Internet is 100 percent correct? If these three honorable people who take pleasure in helping others are imprisoned for their postings on the Internet, how many of us 300 million netizens should expect to be caged? From December 4, 2009 to June 15, 2010, Lihong wrote a total of 23 letters to Sun Chunlan (for the complete set of letters, please see Wang Lihong’s blog). From the inscriptions at the bottom of the letters, and their time-stamps on her blog, we can see that many of these letters were written in the middle of the night, and posted just before dawn. . . .
Each time I read these letters I’m very moved by Lihong’s persistence and compassion. Where did she get the strength that allowed her to spend sleepless nights to persevere in writing letter after letter to Secretary Sun? I feel that many people are compassionate and intolerable of evil, but what we generally lack is action. Furthermore, we do not believe that action is effective. Every day there is tragic news on the Internet, and over the course of time, our feelings of powerlessness become habitual and we turn a deaf ear. One letter not delivered, two letters not delivered, three letters not delivered . . . . This is my ninth letter. I’ll continue writing. Maybe it will take my 100th letter to move you? . . .
Today, a woman from the Fujian Provincial Office in Beijing told me that Secretary Sun will not read the letters. “To tell you the truth,” she said, “she won’t let them get anywhere.” I used to work for a government office and I know the way documents are circulated. But I still want to write. Otherwise, the heat of the grief and indignation flowing through my veins will make my blood vessels burst. I may write 100 letters, or even 1,000. . . . This land of China has already suffered too many miseries; we really don’t want to see any new wounds inflicted. People like them are like the white blood cells protecting humanity itself ! They are so rare in the world, and we should protect them—not fabricate charges to destroy them. . . .
On the 29th day of the 12th lunar month I made steamed buns. There was good news today: Feng Zhenghu11 came home for Chinese New Year. In his Chinese New Year speech, Premier Wen Jiabao stressed that everything we do is to make the Chinese people’s lives happier and to allow them to have dignity. As we approach the New Year, would not releasing the innocent Three Netizens be a good way to harmonize the society? Today, the Three Netizens’ case has become part of history. In a few days, it will be one year since You Jingyou walked out of prison. I believe that, apart from He Yang’s documentary, Lihong’s 23 letters will be remembered in the annals of history. Many years from now, when Chinese citizens are no longer hounded for posting on the Internet, can supervise the authorities without fear, and can take part in public affairs, they should know that all this began with the efforts of ordinary citizens. That seven months after the Three Netizens’ case ended, Lihong could be detained and then formally arrested is a testament to how brutal the environment is for the fight for freedom. That evening I met Lihong for the first time. With my lecture canceled, I had a lot of free time and we were able to talk leisurely. Lihong talked with me excitedly about the German movie, Der Vorleser (The Reader). We talked about the the banality of evil shown in the movie; Lihong even took out her recorder and began taking audio notes. At the time, I thought she was planning to write a review of the movie, but she did not have time to do it. On October 8, Lihong and a group of others, including Xu Zhiyong,12 He Yang, A'er,13 and the Butcher, were all detained because they had gathered for a dinner to celebrate Liu Xiaobo’s Nobel Peace Prize. They were taken to a police station, where Lihong was kept for eight days. There is simply no justification for the arrest of Lihong this time based on her personal behavior. After she was detained for eight days last year because she took part in a celebratory dinner for Liu Xiaobo, Lihong was put under house arrest for three months with no freedom of movement. It was not until January 21 this year that the guards downstairs from her apartment were withdrawn. While she was under watch, I would occasionally see her on Skype and we would exchange a few words. Did we discuss national politics? No. I most often tell her to eat the leaves of the goji berry plant which are good for her blood, that she should take care of herself, and talk to her about the changing world outlook on health care, etc., etc. The questions she would ask me were: What kind of hairstyle should I have? I feel short hair is nice. What about shaving my head? Too radical. I have a lot of white hair. Don’t dye your hair, it’s poisonous. . . .
. . . [F]rom a legal point of view, making a citizen write a guarantee letter pledging to not do things that are not illegal in order to have freedom of movement is illegal and a mockery of the law. I am a citizen of the People’s Republic of China. I have the right to live on the land of my own country and the right to freely move around. I am a person with conscience and I cannot guarantee that I will remain silent in the face of suffering. I cannot guarantee that, when I face the stories of Qian Yunhui,16 Tang Fuzhen,17 Li Shulian . . . I will pretend not to see. . . . If I remain silent when confronted with suffering and wickedness, then I will be the next person beaten down by evil. You as law enforcers, the restriction you place on my freedom is illegal and has seriously affected my life. I hope that law enforcement and related departments and personnel will quickly correct their illegal actions and give me back my freedom. —Wang Lihong, citizen of the People’s Republic of China. Shortly after returning to Beijing, on March 21, the Chaoyang District police took her away and searched her home. She was formally arrested on April 20. By now, she has been in police custody for 102 days. Since the end of February—from Ran Yunfei’s20 detention and arrest, to the disappearance of Ai Weiwei21 and others—a series of events has occurred that has left people unsettled and shocked. Eventually Teng Biao,22 Jiang Tianyong,23 Ai Weiwei, and others have been released, while the situation Lihong is facing remains unchanged. Each day on Twitter, I see only a very small number of netizens who still tweet information about Lihong. One persistent tweet is, “Let my mother come home to eat!” by Lihong’s son, Xiao Qi. When Ai Weiwei was detained, there was news about him every day around the world, and there were even websites that collected discussions about him. There was no such effort on behalf of Lihong. Aside from the blog posts of netizen Qiu Mazha,24 I saw no other commentaries about Lihong. One real problem is that Lihong’s friends have been beaten and warned individually. Some no longer use Twitter, while others continue to go online but keep a low profile. I think, perhaps, it may be more difficult to speak out about Lihong than Ai Weiwei. This is because, when you speak out for Ai Weiwei, the artist’s international reputation gives you a powerful protective screen. But Lihong is a just an ordinary Beijing citizen, and netizen, that’s all. There is only the smell of gunpowder, as if in New Year. There are only poems, left unwanted in the street like nonsense.